This site has set cookies. Food and Drink Advanced Engineers deliver efficient, effective and high performance food and drink production processes and systems, many of which are specific to the industry. Combining engineering competence with an understanding of the principles of food safety, science and technology their focus is on developing and designing improved production systems, which are safe to operate and environmentally sustainable. They use advanced production and processing techniques and project management skills to deliver new projects on time, to budget and at the required quality. Food and Drink Advanced Engineers have roles across food and drink organisations, from infrastructure, asset care, production management and process development and work closely with a range of other engineers, functions and managers in their own company and interact with external equipment and ingredient providers. They contribute to business strategy and performance as leaders of teams. 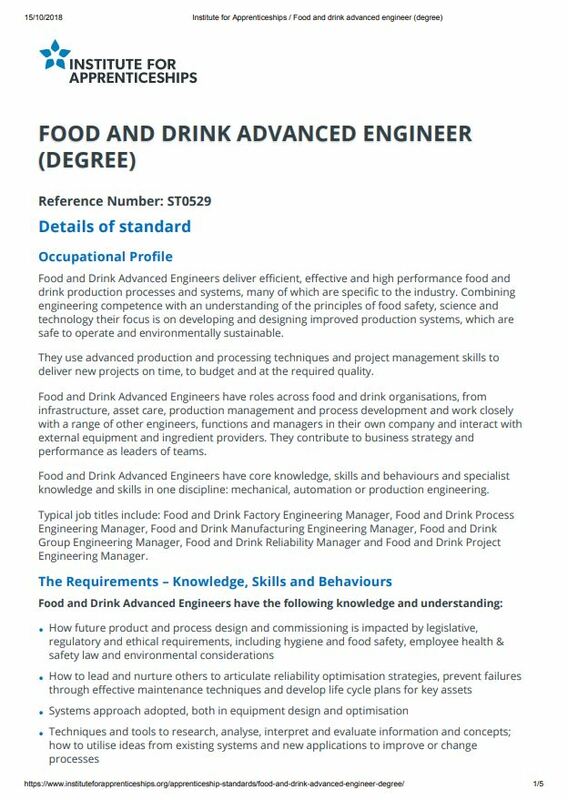 Food and Drink Advanced Engineers have core knowledge, skills and behaviours and specialist knowledge and skills in one discipline: mechanical, automation or production engineering. Typical job titles include: Food and Drink Factory Engineering Manager, Food and Drink Process Engineering Manager, Food and Drink Manufacturing Engineering Manager, Food and Drink Group Engineering Manager, Food and Drink Reliability Manager and Food and Drink Project Engineering Manager.